Rep. Gerry Connolly, D-Va., is concerned that Federal Chief Information Officers (CIOs) are struggling to make sure their agencies follow the Federal Information Technology Acquisition Reform Act (FITARA). Connolly said that he and his colleague Rep. Darrell Issa, R-Calif., who helped write FITARA, created the act as a way to streamline the IT acquisitions process and properly use the $80 billion the government spends on IT. Congress monitors how well agencies enact FITARA mandates through a scorecard. The third scorecard is set to be released Tuesday at a joint House subcommittee hearing. Connolly said that the scorecard helps Congress check the progress of Federal agencies and allows for more CIO empowerment. He said Congress wanted to “include CIO authorities” in the scorecard to determine if these officers are adequately instituting incremental development and have enough tools to succeed. The latest scorecard reveals that some CIOs are having trouble rallying support for the act within their own departments, according to Connolly. 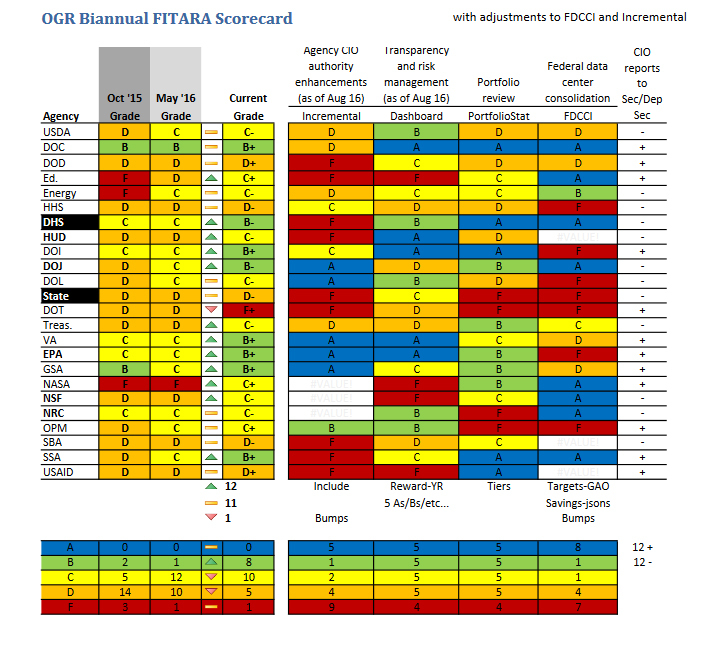 MeriTalk will have the full story on the third FITARA Scorecard following today’s hearing, which is scheduled to take place at 2 p.m.
UPDATE: The committee released the following scorecard ahead of today’s hearing.